Depending on how you measure it, China is either the world’s biggest economy or hot on the heels of the current leader, the US. Some economists (including the IMF and the World Bank) have China at number one, adjusted for purchasing power in local prices. On more conventional measures others have the US in the lead—but, given China’s greater rate of growth, probably for only another decade or so. Either way, the global balance of power is very definitely tipping. China’s economic strength is increasingly being translated into influence, hard and soft. As Lenin put it: “Politics is the most concentrated expression of economics”—ultimately economic power is measured in trade, political and cultural influence, but also in submarines, fighter jets and aircraft carriers. This poses a major strategic challenge for the Australian ruling class. For the first 150 years after invasion, the colonies and then the federated nation state looked to Britain for support, guidance and, ultimately, military backing in its efforts to dominate the region. World War Two made it painfully clear that the British Empire was in terminal decline. The failure of the British to defend Singapore from the Japanese in February 1942, followed by the bombing of Darwin, drove home the point. The alliance with Britain was secondary – from now on, Australia’s alliance with the US took centre stage and remains there today. The US emerged from the war the world’s pre-eminent industrial and military power. In 1960, it generated 40 per cent of global gross domestic product. It bankrolled the post-war reconstruction of western Europe, ran a military machine with more than 800 foreign military bases, and provoked and won a nuclear arms race with Russia that helped bring down the Soviet Union in 1991. Today, its share of global GDP is down by about half. While its military spending is still greater than that of the next eight military powers combined, defeats in Afghanistan and Iraq starkly show the limitations on its power—a fact underlined by the way the US has played second fiddle to Russia in Syria. China under Xi Jinping is beginning to flex its muscles with greater confidence. Notably, it has advanced its claim to the bulk of the South China Sea by building military bases on atolls that are also variously claimed by Vietnam, the Philippines, Brunei, Malaysia or Taiwan. It now boasts its first overseas military base—in Djibouti, in east Africa and near the mouth of the Red Sea. To the consternation of the Australian foreign affairs establishment, Fairfax media reported on 10 April that China was looking to establish a base on Vanuatu in the South Pacific, Australia’s “back yard”—a subject I’ll return to later. China’s economic initiatives are strikingly bold. It is committing potentially $10 trillion for its One Belt One Road initiative (OBOR, sometimes referred to as the Belt and Road Initiative or BRI), an amount which would dwarf the US investment in western Europe after World War Two. At the heart of OBOR is the building of infrastructure for land and maritime trade—highways, high-speed railways and ports, involving 65 countries. China is using surplus capital to project its power beyond its immediate region and to open up new supplies of minerals and other resources and new markets into which to sell. This is a pattern that emerged in the last quarter of the 19th century as corporations, first in Britain, and then its main competitors, began to exhaust the possibilities for domestic growth. Strong nation states, defending the interests of their biggest corporations, began to expand globally in a stage of capitalism known as imperialism. The process was characterised by two major features—rivalry between the imperialist powers and the economic and/or military subjugation of less developed economies in Africa, Asia and Latin America—rivalry that led to two world wars and countless other conflicts. At each stage, the dominant power virtuously espoused “free trade”—in other words, no obstacles to it dominating markets. First it was Britain, then the US and now the mantle has passed to China. In a sign of its relative decline, the US under Trump is now instituting tariffs and risking a trade war. The world is becoming a more unstable and dangerous place. How is the Australian ruling class reacting? There are a range of responses, all of which reflect that while Australia is firmly embedded into the US military and intelligence systems, China is Australia’s biggest trade and investment partner, with two-way trade in goods and services worth more than $735 billion in 2016-17. China takes almost 33 per cent of Australia’s exports (primarily iron and coal) and provides 22 per cent of Australian imports (mainly telecom equipment, computers and furniture). At one end of the spectrum are those who identify China as, essentially, the enemy. Academic Clive Hamilton has become their flagbearer, using his book, Silent Invasion: China’s Influence in Australia, to argue for a rejection of Beijing’s influence and for resistance to “betrayal by our elites”. “There is a widespread view,” he writes, “that China’s rise is unstoppable, that our economy’s fate is in Beijing’s hands, and that China’s size means it must dominate Asia. So it’s best if we go along with this historical inevitability, because we don’t really have any choice, and it won’t be such a bad thing anyway. Silent Invasion is a throwback to a 1950s-style anti-communism, complete with lurid tales of apparent traitors, fifth columnists and dupes. Sydney University academic David Brophy has been one of its most effective critics, pointing out that while, “the idea that Australia’s sovereignty is threatened by a vast Chinese conspiracy has been a popular talking point … many of Australia’s China experts reject this narrative. More than that, they see it as divisive and dangerous”. But while it’s easy to point out the one-sided nature of Hamilton’s argument, which by conflating the Chinese government with Australians of Chinese heritage risks feeding the existing racist narrative around Chinese who buy houses and farmland, he does highlight how sections of the Australian ruling class are indeed open to moving closer to China. Bob Carr, for instance, former Premier of NSW and Minister for Foreign Affairs, is quoted as saying that Australia must leave behind its “sentimentality” for the US alliance, reduce its ties with an America in decline and focus on China’s enormous importance for the Australian economy. Another Labor heavyweight, Sam Dastyari, damaged his political career by parroting China’s line on the South China Sea and seeking money from a pro-Beijing Chinese-Australian magnate before destroying it when he was caught warning another rich Chinese-Australian benefactor that his phone was probably being bugged by Australian intelligence. The majority of the ruling class is firmly committed to the US alliance. Responding to the claims about a Chinese base on Vanuatu, Malcolm Turnbull made clear that Australia would not accept such a development. “The maintenance of peace and stability in the Pacific is of utmost importance to us, to Australia—it’s one of the key priorities of the foreign policy white paper,” he said. By foreign, he meant Chinese. There are no objections to US bases in Guam, Hawaii, Japan, South Korea and, of course, Australia. The French have a military presence in New Caledonia, again without Australian complaint. The election of Trump means some in the ruling class are open to adjusting Australia’s stance while remaining in the US alliance. “Australia’s alliance with the US undoubtedly gives us both the capabilities and the confidence to push back against those of Beijing’s activities we object to. So the logic of regional tension is to try to draw the US in closer while at the same time boosting Australia’s military capability. The Gillard Labor government welcomed US marines being stationed in Darwin as part of Obama’s “pivot to Asia”. Trump seemed to be critical of Obama’s pivot, arguing with countries, including Japan, that, “we can no longer be taken advantage of, or enter into a one-sided deal where the United States gets nothing in return”. But that hasn’t stopped the number of marines in each deployment in Australia increasing from 1250 to 1500. The Turnbull government is going further, committing to increasing annual military spending from $32 billion to $59 billion by 2026 (2 per cent of GDP) and buying 12 new submarines and a fleet of frigates. The Liberals have declared they want to see Australia become one of the top ten defence exporters by 2028—up from 20th biggest arms exporter today. Turnbull is also exploring new alliances that might help restrict China’s advance. In January he visited Japan and agreed to promoting “deeper and broader defence cooperation” including exercises, operations, capacity building and visits by the military forces of the two countries. The two countries are involved, alongside the US and India, in the Quadrilateral Security Dialogue (known as the Quad). It has lain semi-dormant for a while—now Australia and Japan are re-committing to the loose alliance. The Liberals have welcomed Indonesia’s suggestion that Australia join ASEAN—the Association of Southeast Asian Nations—many of whose members are acutely concerned about China’s expansion. The government is also considering a “freedom of navigation” exercise in the South China Sea—following on from the US example of sailing warships close to the atolls that have been fortified by China. Yet at the same time as toughening up their position on the military and diplomatic fronts, the ruling class knows the relationship with China, especially the economic relationship, has to be nurtured. 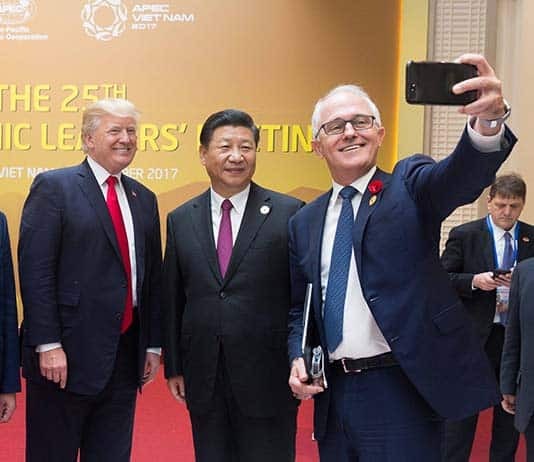 Turnbull has signalled that he is open to China joining a new version of the Trans-Pacific Partnership “free trade deal” now that Trump has dumped US involvement. The Liberals under Tony Abbott took Australia into the Asian Infrastructure Investment Bank, an initiative by China to rival the Asian Development Bank and the World Bank. Australia committed $3.7 billion to the bank’s founding capital, making it the sixth largest supporter out of the 61 member nations. The US declined to join. And both Liberal and Labor have flagged interest in participating in China’s investment plans, in particular in concert with Australia’s development plans for the north of the continent. The balancing act between economic collaboration and diplomatic and military rivalry is being constantly recalibrated. A Chinese company was allowed to buy a 99-year lease for the port of Darwin but Chinese telecom giant Huawei was blocked from tendering for the NBN and may be barred from taking part in the roll-out of Australia’s 5G mobile phone network. The President of China, Xi Jinping, was warmly welcomed to Australia in November 2014 and addressed parliament. But Turnbull late last year tabled new legislation aimed at curbing foreign interference in Australia, including a ban on foreign donations to political parties and activist groups, and tougher rules for those lobbying on behalf of foreign interests—clearly aimed at Chinese influence. This agonising will continue for years to come. Australia is caught between its traditional ally, which is in gradual decline, and a rising regional power, on its way to becoming a world power. For the Australian ruling class there is no easy answer. For socialists, however, the position is much clearer. We are against both imperialisms—American and Chinese—and the tensions between them that fuel the risk of war. Workers have no interests in the success of either power bloc. We also reject Australia’s sub-imperialism—its bullyboy treatment of Papua New Guinea and the South Pacific island states, its growing militarism and its willingness to participate in US-led wars from Afghanistan to Iraq. We oppose the military alliance of Australia and the US and call for all US bases in Australia to be closed, and US troops to be withdrawn. Rather, we are for solidarity with the workers and oppressed fighting back in the US and China—in the belly of both beasts. We are with Black Lives Matter, the #MeToo movement, the West Virginian striking teachers and all those inspired by them, and with the millions on the streets against Trump. And we are with the factory workers in Guangzhou, making luxury handbags for the US fashion label Michael Kors, whose eight-day strike in March ended in victory, with the workers at Apple’s supplier factory, Wuxi Green Point, who blockaded the factory over sackings, and with the peasants rioting over land theft and corruption.